David Walters Yachts is pleased to announce the opening of their Newport, RI, office with John Osetek at the helm. John's on the water experience is a varied as his marine business experience, from racing Thisles on Lake Ontario as a teenager to acting as operations officer aboard a fleet tanker during his service in the US Navy. With over thirty years in the marine industry assisting clients in buying, selling, financing and building power and sailing yachts, John's experience and expertise run from runabouts and day sailers to custom world cruisers. His ten plus years with Alden Yachts make him a valuable resource for current Alden owners or those interested in purchasing an Alden. 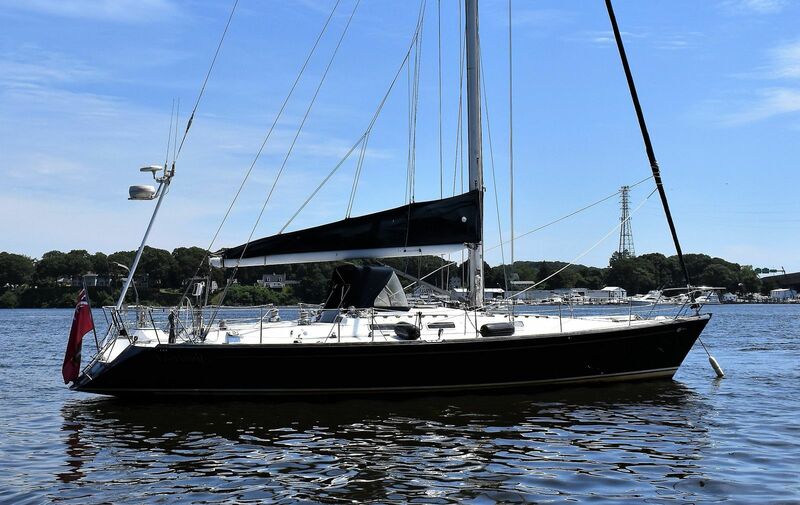 A stunning example of this racer/cruiser design, she has a Flag Blue hull (98), custom Clearwater Marine keel (7'6"), 8 KW Kohler diesel generator, Marine A/C, electric winches, North inventory, entertainment center, Raytheon GPS and repeater interfaced with Questus mounted radar '02, carbon fiber spinnaker pole & much, much more. 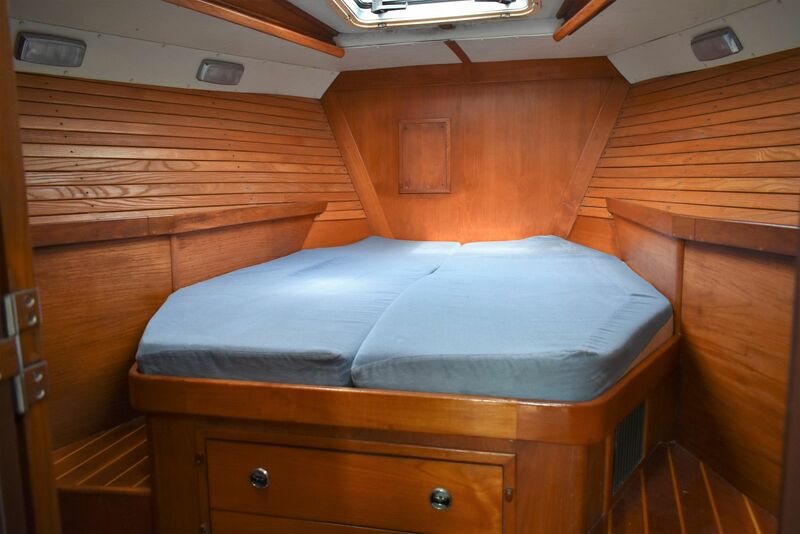 This 'gem' is a yachtsman's dream come true. "SOMERSET" has a Flag Blue Awlgripped hull ('98) with a white boottop and gold cove stripe. The bottom and keel received three (3) coats of epoxy and VC Offshore paint . The 7'6" custom keel was designed by Craig Walters Clearwater Marine naval architect ('99). "SOMERSET" accommodates six (6) in three (3) cabins. 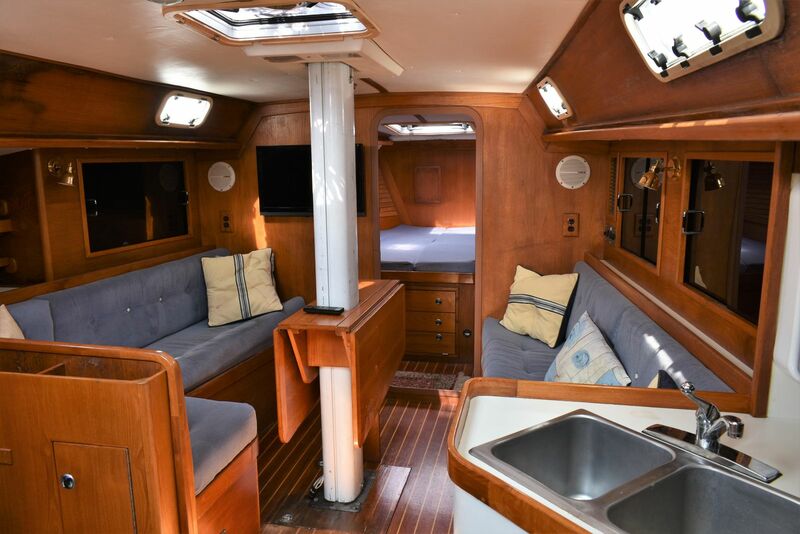 Forward is the owner's cabin with a centerline queen with the main salon amidships with settees to port and starboard, entertainment center to starboard. The galley is to starboard with the guest stateroom aft. The nav station is to port with the enclosed head aft; walk-thru to generator and work/storage room. The interior is satin-varnished teak with a varnished teak and holly sole. Headroom is 6'3" and the upholstery is blue fabric. 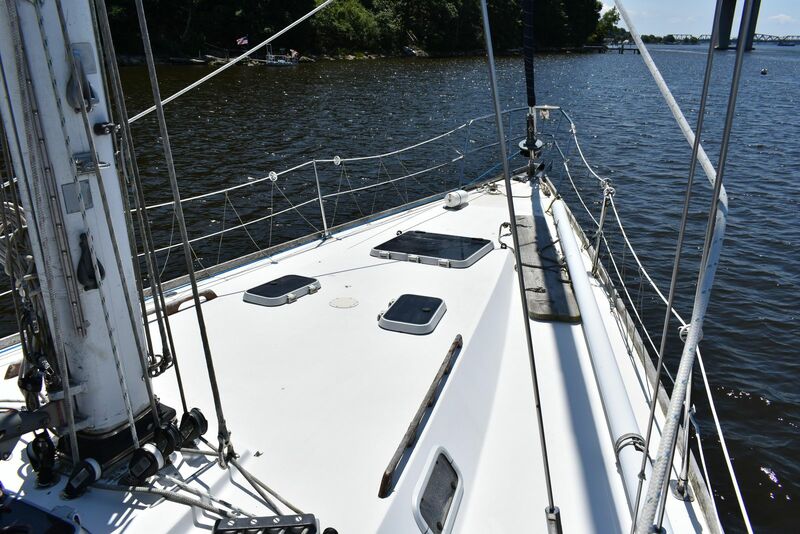 Forward is owner's private cabin with a centerline queen. There is storage under the berth and in two (2) hanging lockers; en-suite entrance to the enclosed head; privacy door. 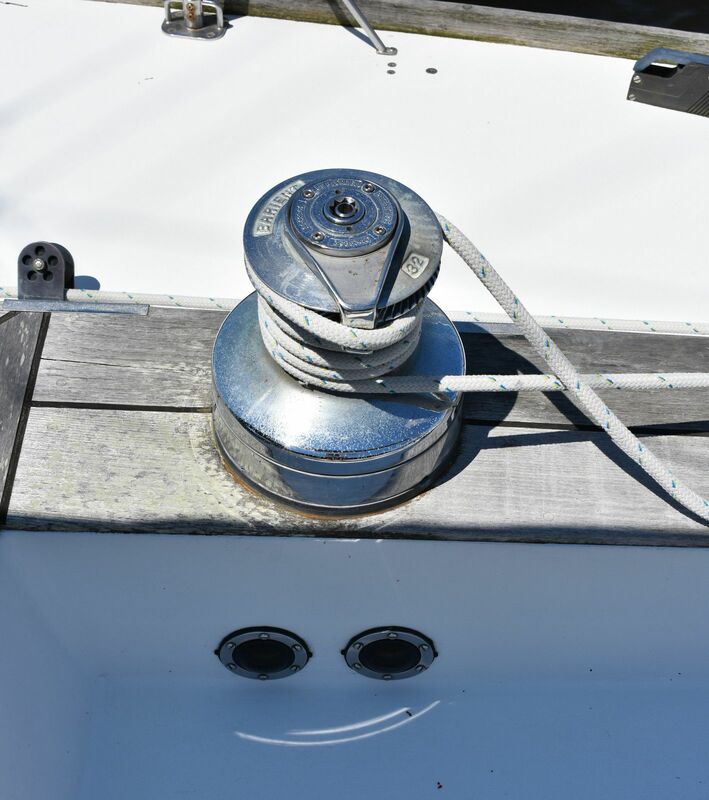 Light and ventilation are provided by an opening overhead main hatch and two (2) small overhead hatches. 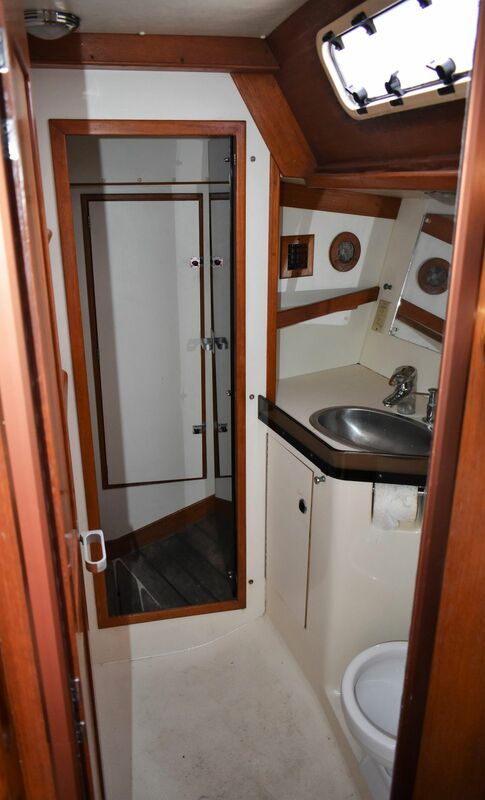 The enclosed head is to port with a manual marine toilet; vanity with storage under, hot and cold pressure hand-held shower, storage outboard in lockers, teak floor grate, opening port, exhaust fan. The main salon is amidships with an "L"-shaped settee to port and a straight settee to starboard. There is storage above and outboard both to port and starboard; Lee cloths The starboard side features an entertainment center above and outboard with a 9" color television with VCR, Sony 10 disc CD with AM/FM stereo with cassette tape player with cockpit remote and four speakers (two in the cockpit and two in the main salon); centerline-mounted fixed table; foot lights and security lights. There is one (1) opening overhead hatches and two (2) opening ports. 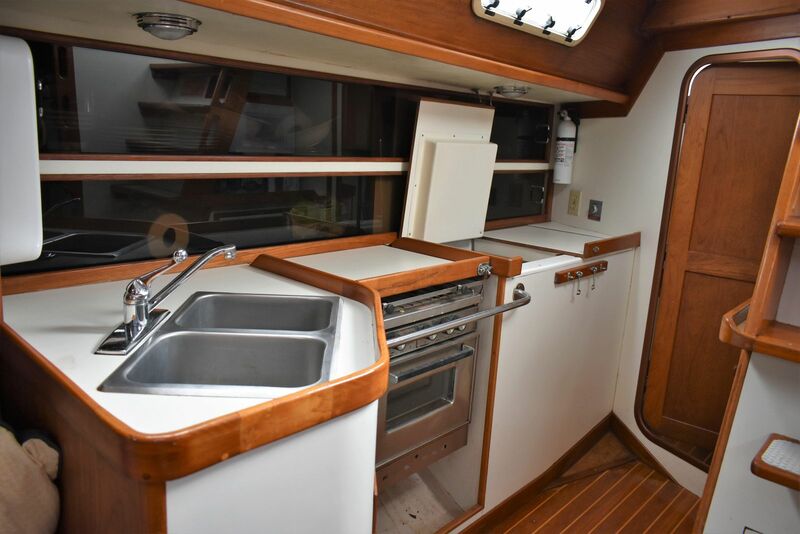 The outboard-facing walk-through galley is next aft to starboard. There are double stainless steel sinks with storage under, hot and cold pressure water, water heated off the engine or generator and dockside. The ice box is top-loading with 110-volt Sea Frost refrigeration (also 12-volt dockside). The gimballed stainless steel three-burner Tasco propane stove has an oven and storage below for pots and pans; Sharp microwave. Storage is above and outboard in lockers; opening port. 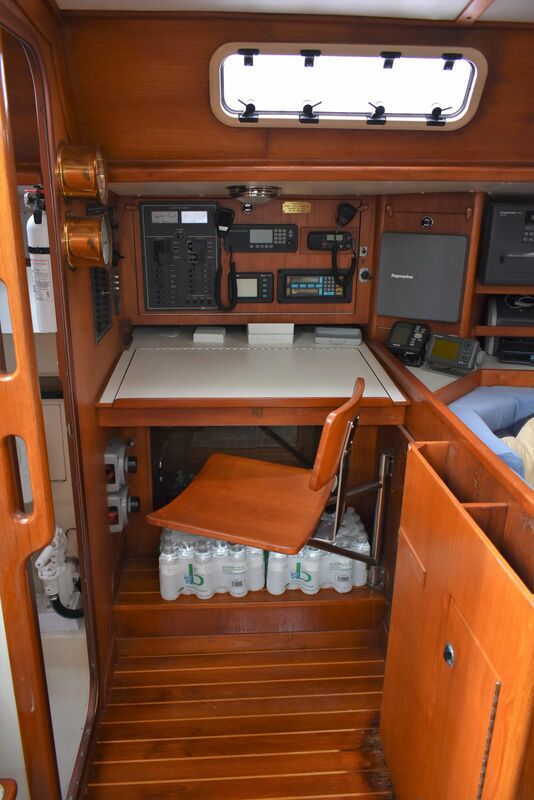 The sit-down outboard-facing navigator's station is directly opposite to port. 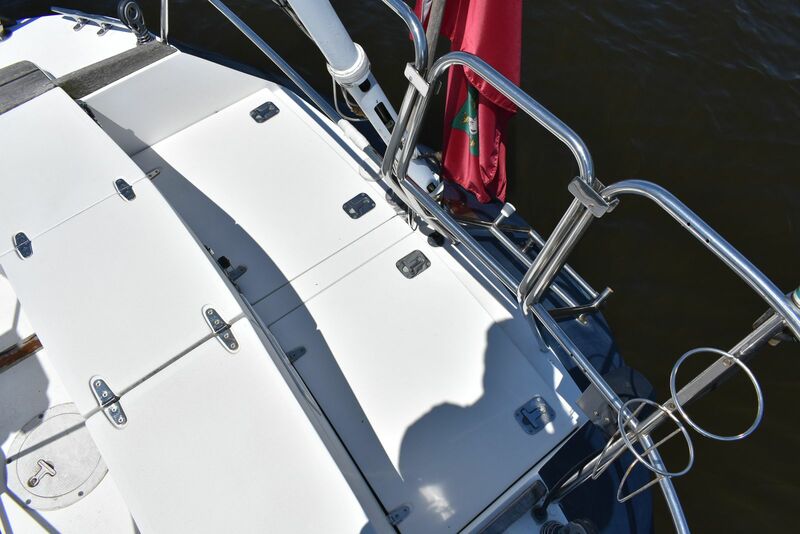 There is a lift-top chart table with chart storage under, electronics/instruments mounted above and outboard, teak swivel seat; opening port. 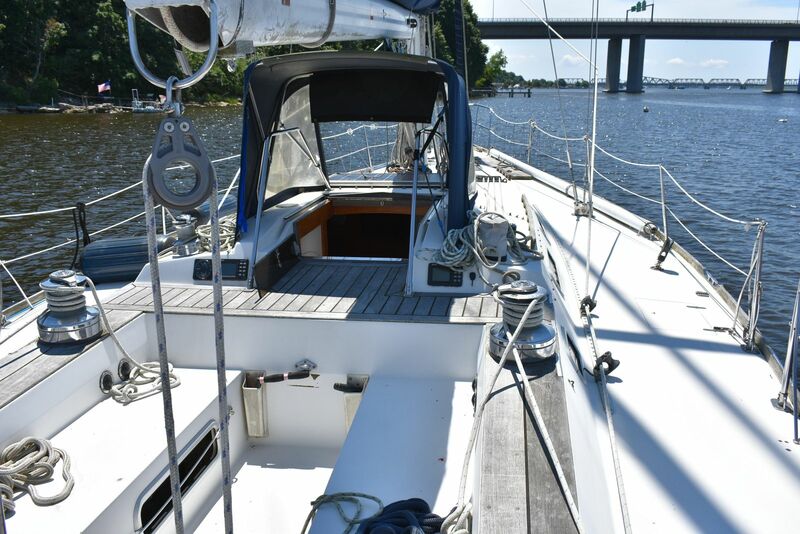 The aft cabin is to starboard with a double berth that sleeps two (2); Lee Clothes; two (2) opening ports and hanging locker and additional storage to starboard. "SOMERSET" has a total of five (5) 12-volt (DC) batteries with cicuit breakers, battery charger, engine alternator, 110-volt (AC) shore power with power cord, interior lights and navigation lights including masthead and deck running lights with emergency battery, five (5) AC outlets. The hull is constructed of Vinylester Resin in a hybrid Kevlar/E-glass matrix. Reinforcements are biaxial and triaxial over a balsa core. The emphasis is on high strength and stiffness as opposed to low weight so as not to compromise seaworthiness. The hull is Flag Blue Awlgrip ('98) with a white boot top and gold cove stripe. The keel is a custom keel by Craig Walters Clearwater Marine naval architect ('99. The draft is 7'6". Three (3) of epoxy and VC Offshore paint . The wing keel was removed and a lead shoe was attached. The shoe is bolted up thru the old keel; it can be reversed to make the draft less. Keel cast by Mars. "SOMERSET" has Hall painted aluminum spars with double spreaders; stainless steel rod rigging; the mast is stepped on the keel. She has two (2) head foils, Harken roller-furling and Tuff Luff, Quik vang, hydraulic backstay, elkhide leather-covered carbon fibre spinnaker pole by Forespar ('00), aluminum spinnaker pole, Navtec hydraulics in the cockpit, storm trysail track on the mast, new running rigging ('99), new mast step ('99). There are a total of six (6) self-tailing Barient winches: two (2) Barient #32 ST self-tailing electric primary winches, two (2) Barient #24 ST self-tailing two-speed winches, and two (2) Barient #27 ST self-tailing winches mounted on the cabintop. There are four (4) lock-in winch handles. "SOMERSET" is powered by a 1991 Yanmar 46 HP fresh water cooled inboard diesel engine with approximately 2258 engine hours, oil/water/temperature alarms, fuel/water separator, raw water filter, gauge for main water tank ('00), feathering prop with two (2) blades (Autoprop), emergency rudder, elkhide leather-covered wheel steering, emergency tiller, manual marine toilet with "Y" valve, holding tank and mascerator, two-station manual bilge pump, electric bilge pumps. 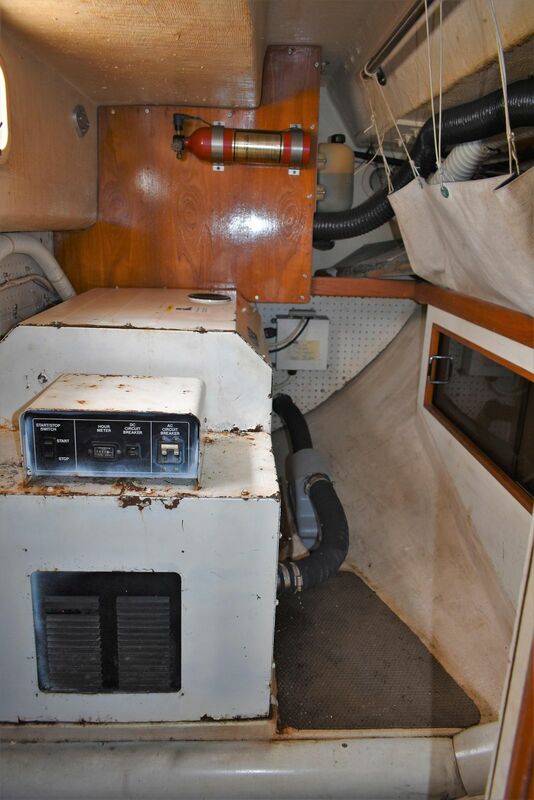 There is a Lewmar electric anchor windlass, Marine Air reverse cycle air conditioning (two units), 8 KW diesel Kohler generator, saltwater washdown pump in the forepeak ('99), hot and cold pressure freshwater washdown/shower aft. * After "SOMERSET" competed in "The Race to the Vineyard" in 1998, the owner was disappointed with her upwind ability. It was then that the wing keel was modified by removing the wings and adding a "shoe" to the bottom of the keel to compensate equally for the weight. Her windward performance improved dramatically as a result of that modification.